A large strenghtening ridge dominates N / E Europe while SW Europe is dominated by a large upper low. 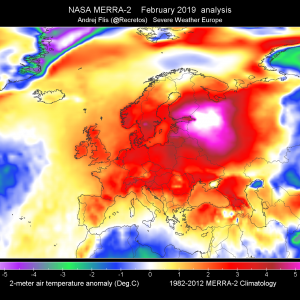 A short wave trough with frontal system pushes into central Europe. Another short wave is pushed into S Iberian peninsula in the afternoon. 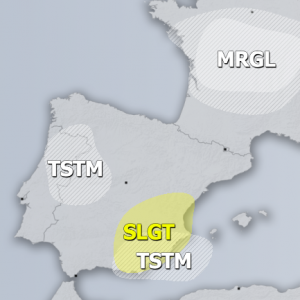 ENH/SLGT risks have been issued for extreme S Portugal and Spain into Gibraltar and N Morrocco with threat for severe storms capable of producing severe winds, torrential and excessive rainfall, marginally large hail and lesser extent for tornadoes. A sharp cold front rapidly moves from NW towards SE across southern Iberia with some marginal instability available within the moderately strong wind shear. A convective line is possible along the leading front, affecting a large area with severe weather. 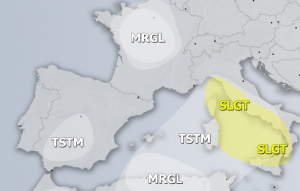 A SLGT risk has been issued for SE France into NNW Italy with threat for excessive rainfall as a result of persisting SE inflow of moist airmass advecting into the Alps, enhancing threat for flash floods due to strong orographic precipitation as well as some convective precipitation at times. Locally 75-100mm in 12-24 hours is likely. 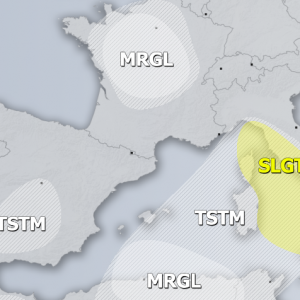 A SLGT risk has been issued for central Italy across Adriatic sea into north-central Balkan peninsula towards W Hungary, E Austria, Czech Republic and into central Germany with threat for severe storms capable of producing severe winds, torrential rainfall and large hail. A frontal system pushes through the southern parts of the risk area from the west, first resulting in excessive rainfall over N Adriatic region where marginal to moderate instability builds up across the warm sector to the east. With moderate shear, strongest cells will organize into severe storms in the afternoon hours. Threat diminshes after dark as instability vanishes. 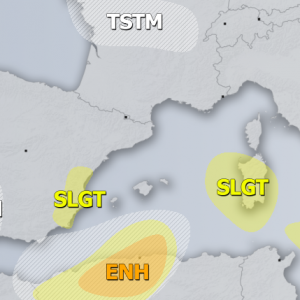 A MRGL risk has been issued surrounding the SLGT areas across central Europe and N Mediterranean where some isolated threat for organized storms exist. Mainly for torrential rainfall, marginal hail and some strong to severe winds. A MRGL risk has been issued for central Turkey with some isolated threat for storms capable of producing marginally large hail, severe winds and torrential rainfall. A WNTR risk has been issued for west-central Alps where excessive snowfall threat exists, 50-75cm of fresh snow within 24 hours is possible above 2000m ASL.